Tesla is ending its generous referral program, which gave new owners free access to its network of Superchargers. From now on, rather than a lifetime of free juice, the first five buddies you refer will only get $100 credit to charge up their new Model S, Model X or Model 3 Performance. Superchargers are the fastest way to give your Tesla's battery a boost, and can complete a full charge in just 30 minutes. They're typically placed on the outskirts of major cities, and are intended to make long-range driving more convenient. 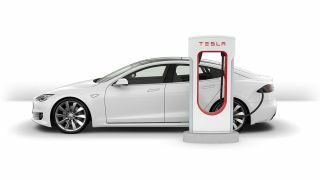 Tesla initially built lifetime access to the Supercharger network into the cost of all its cars, but in 2016 CEO Elon Musk announced that Model 3 buyers would have to pay an extra fee for a quick charge. "The Superchargers are set up, at least to date, for people who bought cars as free long-distance for life," Musk said. "Obviously, that has, fundamentally, a cost. I don't want to make this some big news headline, but the obvious thing to do is decouple that from the cost of the Model 3." It's not all bad news, though – you still get a gift for referring your friends. Take your pick from either a kid-sized Tesla Model S for the little motorist in your household, or a chic black wall connector etched with Elon Musk's signature to jazz up your garage.